Some basic examples for using NCL that have proven helpful. An elegant and secure way to pass arguments to NCL is to set environment variables and then invoke NCL which reads the variables using the getenv function. runncl.sh is a general shell script to pass arguments to NCL. # Universal wrapper script for ncl. echo "Usage: `basename $0` script.ncl argument1 argument2 etc." ./runncl.sh script.ncl argument1 "string argument"
Same script, but now runncl.sh runs in parallel ! 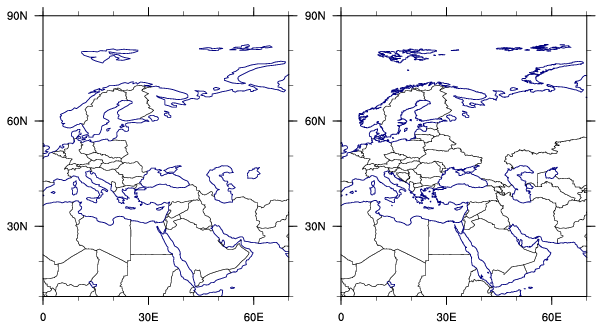 Natural Earth is a public domain map dataset with cultural and physical features. The script below demonstrates how to use this data in NCL. ; and plot them as polylines and polygons. ; This particular example plots data for Switzerland. ;--- Open workstation and define colormap. ;---Set some resources for the map. ;---Loop through files that we want to read geographic information from. 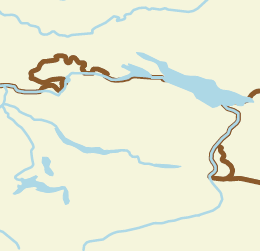 ;---Section to draw polygons on map. ;---This call adds the polygon. ;---Section to draw polylines on map. ;---This call adds the line segment. ;---Clean up before we read in same variables again. ;---We're done adding primitives, draw everything and advance frame. NCL is rather weak when it comes to reading ASCII formats. Your best bet is to preformat your data into a very simple, regular ASCII file and take a look at some examples on the official website. Here is a function to read lat/lon Grid files using the asciiread command. ; the grid or data if necessary. If you have vector data instead of raster data, from Arc/Info, your best bet is probably to use the widely known shapefile format which can be read by NCL (see documention for more information).